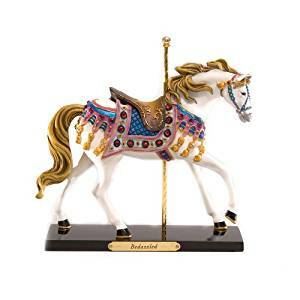 The Bedazzled Pony Figurine is just gorgeous. It’s shiny, sparkly and so pretty. The horse is just stunning there’s so much beautiful bling. This would make a beautiful addition to a Trail of the Painted Ponies collection! Or it would make a beautiful starter piece for a new collection. Return to Share Your Favorite Trail of the Painted Ponies!.